Borers and miners are the larvae of various insects, particularly beetles, flies and moths. 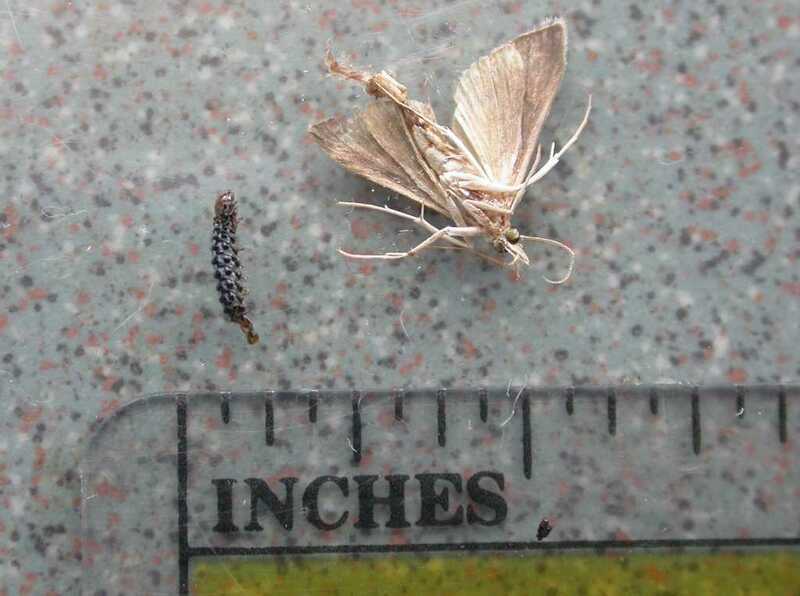 Many of the borers that cause damage to annuals, perennials and vegetables as well as woody plants are the larvae of moths. Since the type of borer determines the appropriate control method, see specific recommendations below. Many of the miners that cause damage to annuals, perennials and vegetables as well as woody plants are the larvae of flies or beetles. For solutions to problems caused by these pests, see Sawflies - Borers and Miners and Flies - Leaf and Stem miners. Specific recommendations for flowers. 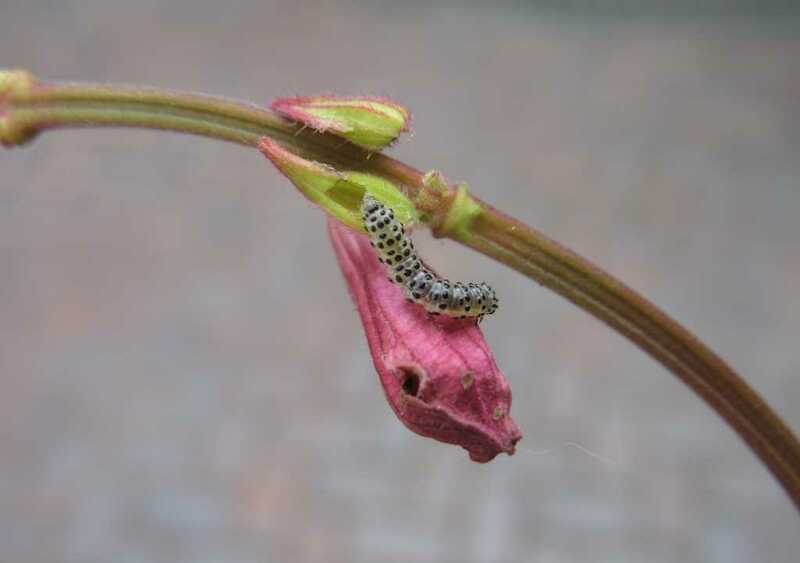 Popular flowering plants susceptible to borers include annual aster, chrysanthemum, columbine, cosmos, dahlia, delphinium, hollyhock, iris, lily, marigold, rose, salvia, snapdragon, and zinnia. Borers typically tunnel into the soft stems of these plants, weakening and often breaking them. If your plants are bent over or their leaves wilt suddenly, check the stems for small, round holes, often accompanied by sawdust like castings (called "frass") which are expelled by the borers. 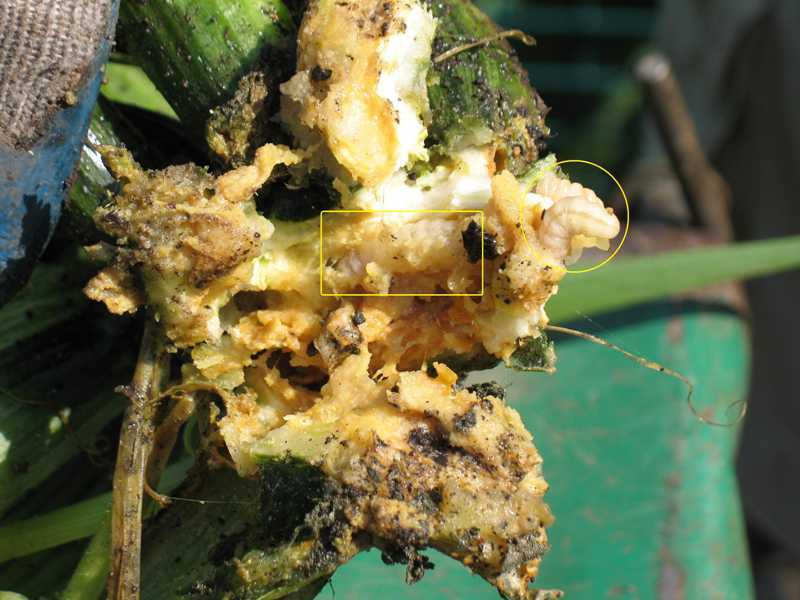 If your bearded iris become infested by borers, the foliage will be disfigured with irregular tunnels or mines in the lower portion of the leaves. In addition, areas of the leaves may appear water soaked, and the centers of the rhizomes may be eaten out. 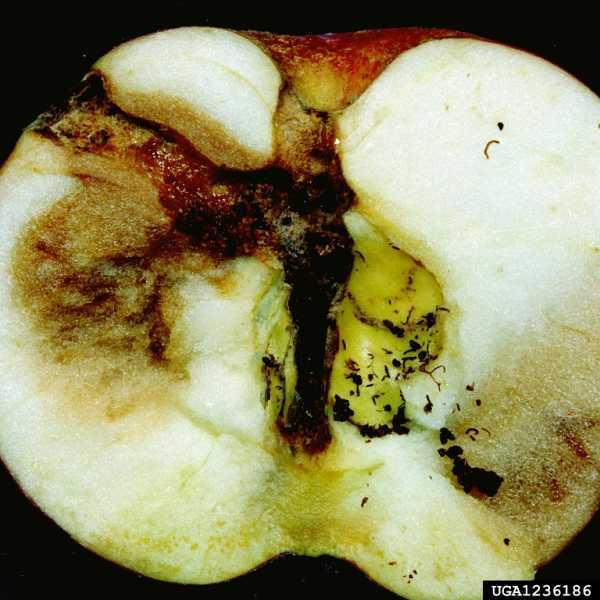 Unfortunately, by the time symptoms of borer damage appear, it is usually too late to save the affected portion of the plant. Therefore, preventive measures constitute the most effective control strategy. Clean up all weeds. Cut and burn any plant stalks that may harbor overwintering eggs or pupae. Rotate the location of vulnerable plants. Cut bearded iris bloom stalks and leaves at the base and burn them. To control borers, parasitic nematodes mixed with water and sprayed on soil are effective if applied in spring before the borers emerge from the soil. 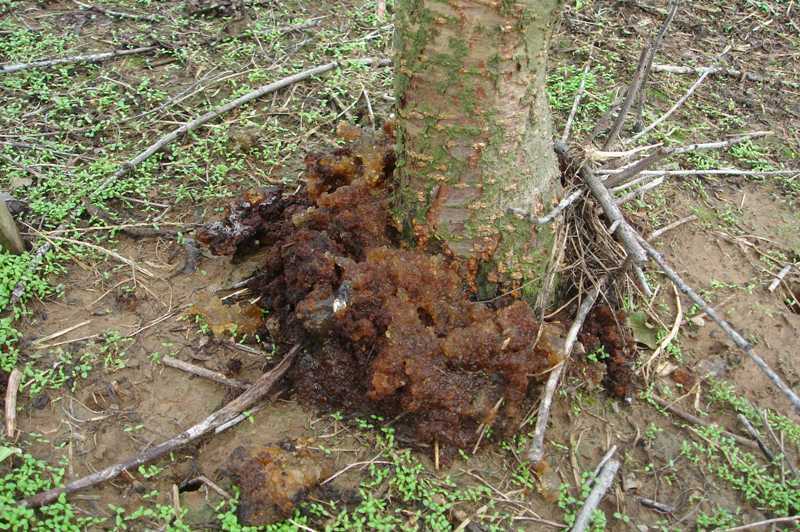 BT (Bacillus thuringiensis) is useful if applied early in the season just as the borers are entering the plants. 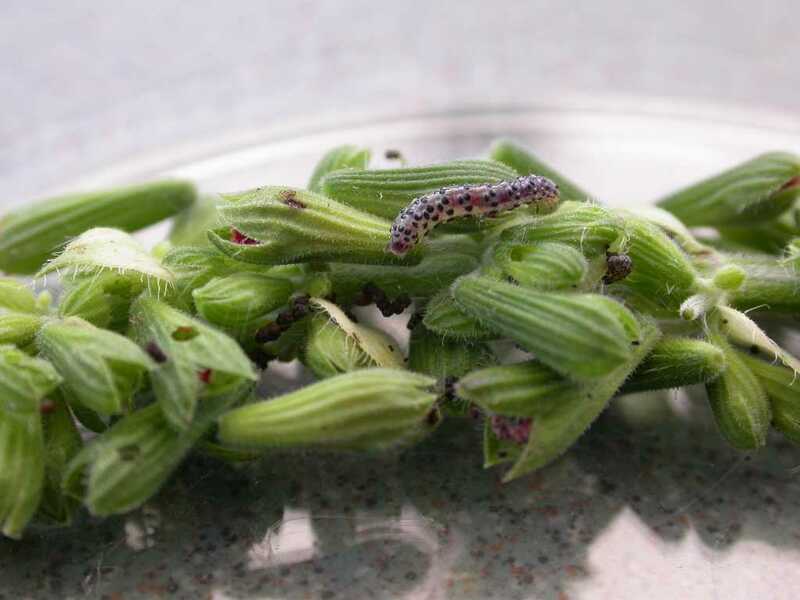 Make several applications at weekly intervals, repeating applications at midsummer if your plants are infested with European corn borers (see Specific recommendations for vegetables, below). You can also inject BT into infested stems one inch above the borer hole. Pyrethrum dust spread around the base of plants will kill hatching borer larvae that emerge from the soil to climb the foliage. An effective if somewhat tedious mechanical control method involves slitting affected stems lengthwise in the area of the borer hole, removing the insect, and binding the stem together with green twine (available from garden centers and nurseries). Inspect bearded iris foliage for borer larvae and pinch them in their mines before plants flower. 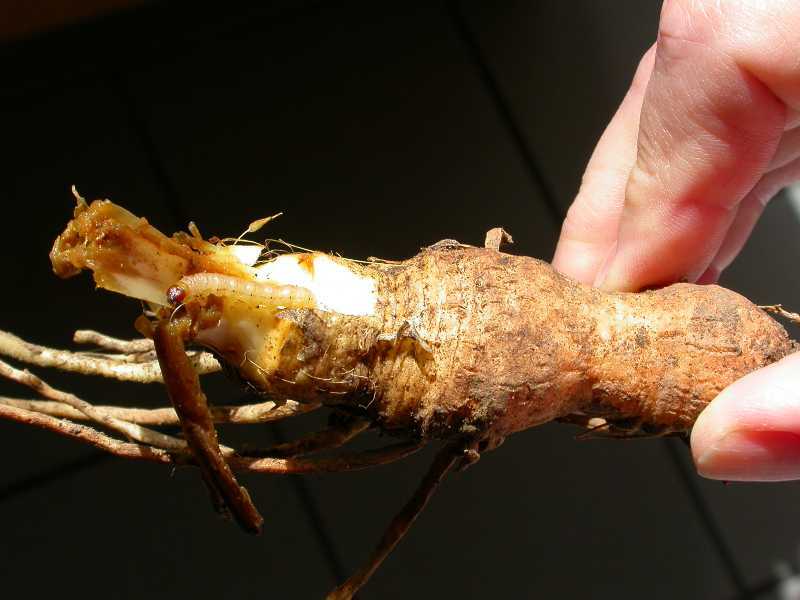 After flowering, dig up infested plants and cut out all infested portions of leaves and rhizomes, kill the larvae, and discard or burn diseased plants. Specific recommendations for vegetables. There are two principal types of borers that damage garden crops. 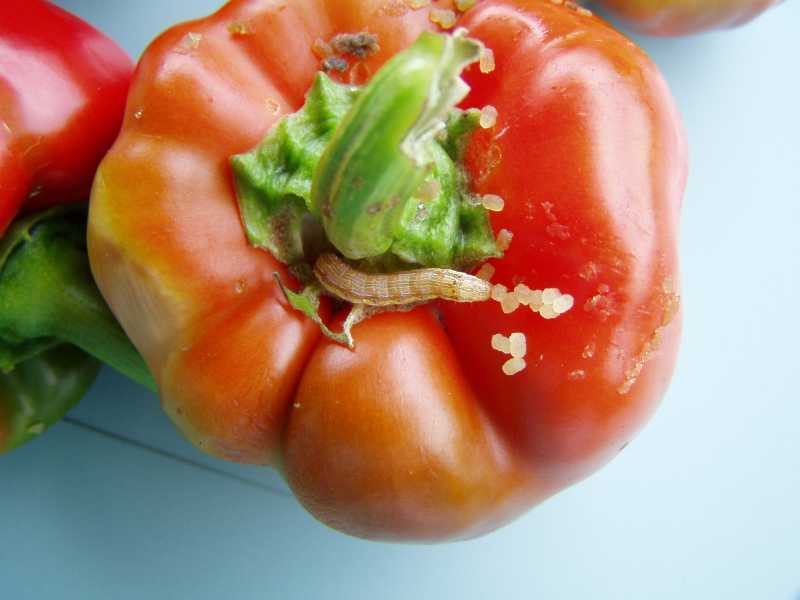 The European corn borer favors chard, corn, peppers, potatoes and tomatoes, while the squash vine borer affects primarily cucumbers, muskmelons, pumpkins, summer and winter squash, and watermelons. 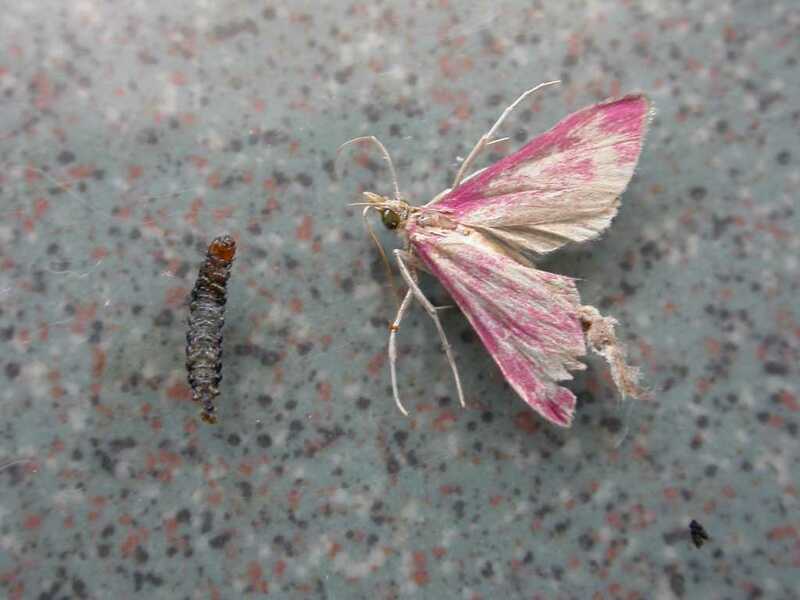 The European corn borer is grayish to pink with a darker head and spots on each segment. The most obvious symptoms of damage are "shotgun" holes in the foliage. Corn borers will also eat the tassels, stalks and ears of corn plants, and the stalks of potato plants. 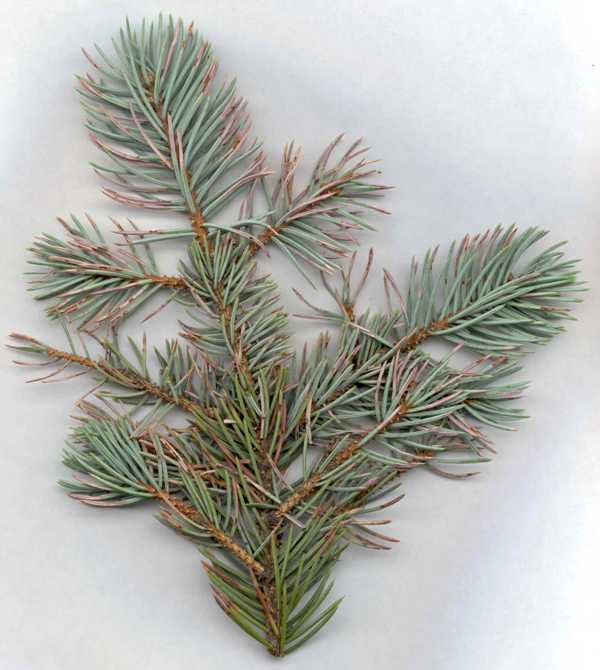 Look for sawdust like trails around the stalks and a gradual wilting of plants. The best control strategy for corn borers is prevention. In the fall, burn or otherwise destroy all garden debris that may be harboring caterpillars. Rotate crops. Try planting resistant varieties of corn and/or interplanting with peanut or soybean. Encourage the presence of predators such as barn swallows, blackbirds, downy woodpeckers, flycatchers, grackles, phoebes, and sparrows. Moles and toads also eat corn borers, as do a number of commercially available insects including beneficial nematodes, green lacewings, lady bugs and braconid wasps. Exclude borers from ears of corn by covering them with old pantyhose. BT (Bacillus thuringiensis), particularly the granular form, is an effective control if applied immediately after the first eggs are laid and then every 7 to 10 days until the egg-laying period has run its course. To remove corn borers by hand, slit affected plant stalks just below the telltale holes and castings and pluck out the worm with tweezers. 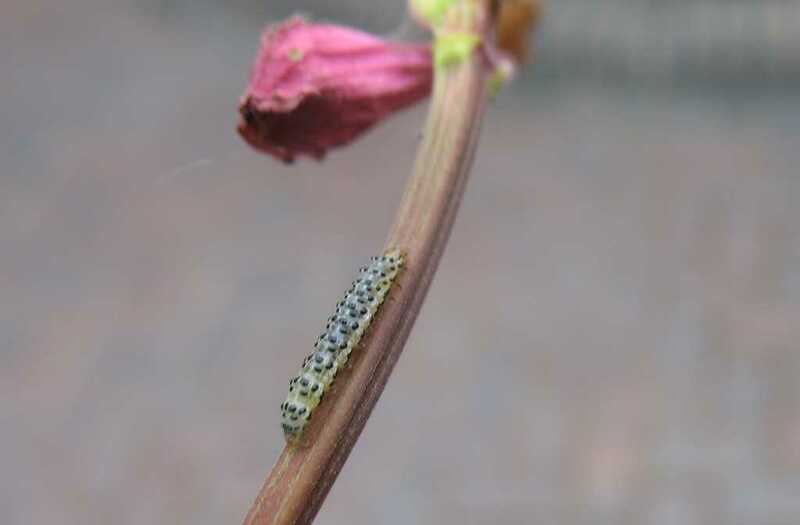 The squash vine borer is a fat white caterpillar with a brown head that tunnels into the main stem of vining plants near the base to feed. The most obvious symptom of damage is the sudden wilting of all or part of a vine. Check individual vines for moist, sawdust like debris (frass) piled outside of small holes. If you cut such a vine lengthwise, you will probably find one or two caterpillars. Since borer damage can be devastating to your crops, exclude these pests from vulnerable plants with an agricultural fleece or netting barrier. 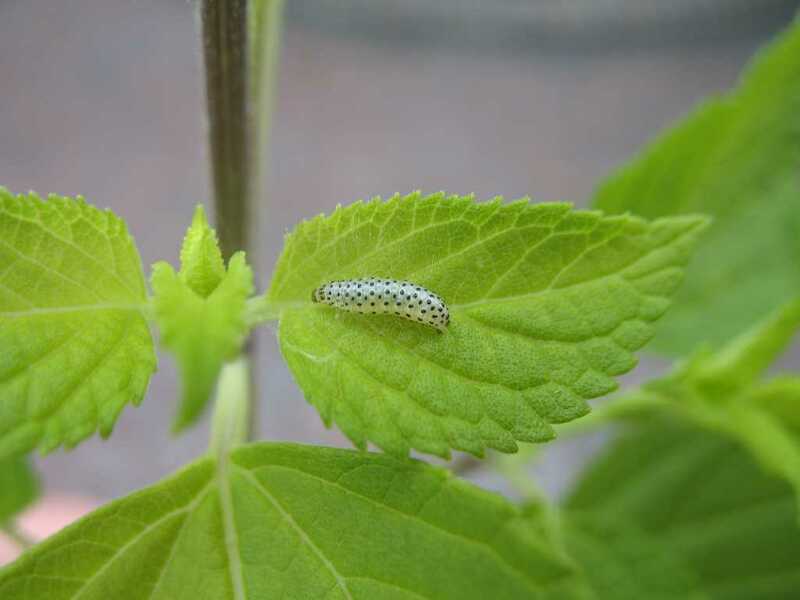 Prevent moths from laying eggs around the base of such plants with aluminum foil mulch, or cut 5 to 10 inch disks from foam-rubber carpet underlay or tar paper, punching a small hole in the center and slitting the disk along one radius. 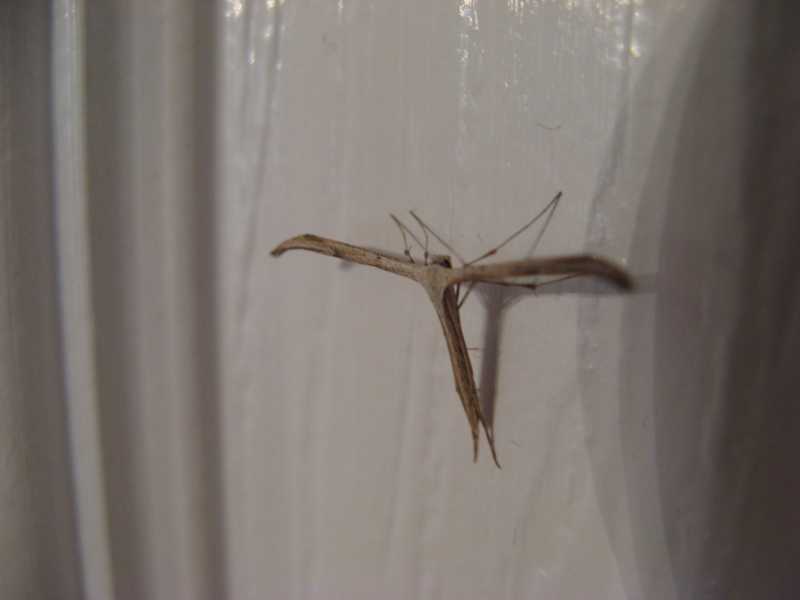 Diatomaceous earth, moth crystals, or wood ashes sprinkled around the base of vulnerable plants may repel the moths. 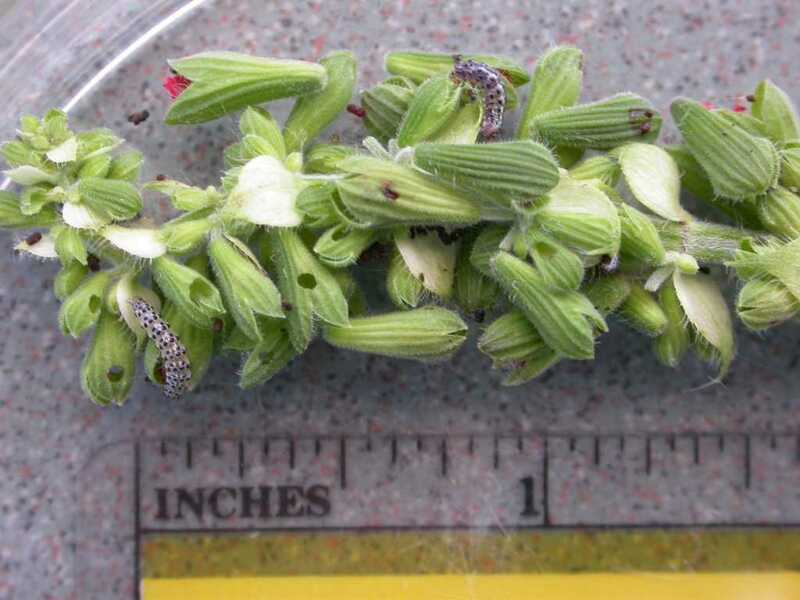 You can control squash vine borers by injecting BT (Bacillus thuringiensis) into the stem with a hypodermic needle or garden syringe, but it is essential that this be done just after they hatch and before they harm the stem; give plants their first inoculation just after the first blossoms appear and repeat treatment in a week to ten days. To control squash borers mechanically, handpick the easily visible eggs from the main stems near the base of the plants; they are brown to reddish-brown and disk-shaped. Slit the stem to remove hatched borers, and then cover it with soil. An effective preventive measure is the so-called "crop cleanup trick." Pull up crops vulnerable to squash vine borer as soon as they finish bearing and put them in a large, preferably clear plastic bag. Tie the bag and leave it in the direct sun for a week or so, and you will destroy a major source of next year's borer population. It also helps to remove all old plants and overgrown weeds after you finish harvesting your crops, leaving the garden soil completely bare for a day or two; this gives birds the opportunity to pick out the pupae and the larvae. Afterwards, cultivate the soil thoroughly to a depth of 6 to 8 inches, and again leave it bare for a few days. Then you can plant your winter cover crop or lay down a 4 to 6 inch winter mulch. About 2 weeks before spring planting, cultivate the garden about 2 inches deep. Leave it bare for a week or so, giving the birds a chance to eat the overwintering pests. Specific recommendations for fruit trees. 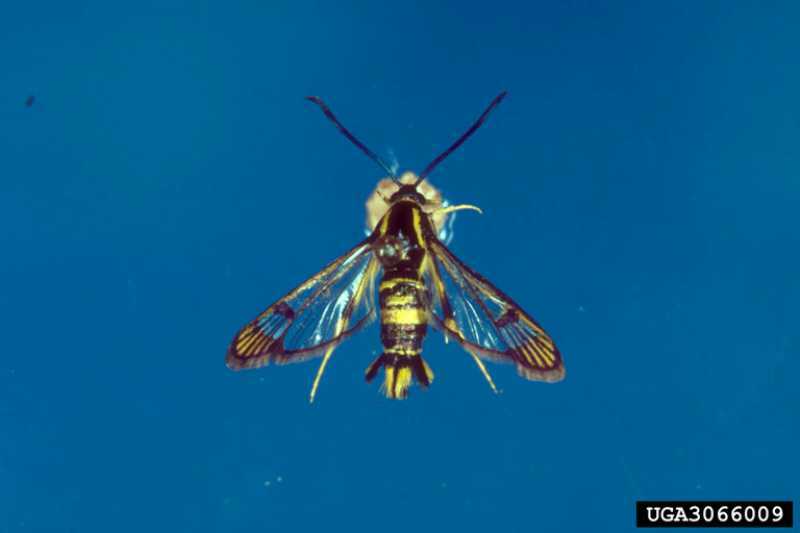 Adult peachtree borers are wasp-like moths. Their larvae are yellowish-white caterpillars with brown heads that bore into fruit trees up to one foot above and down to several inches below the soil. 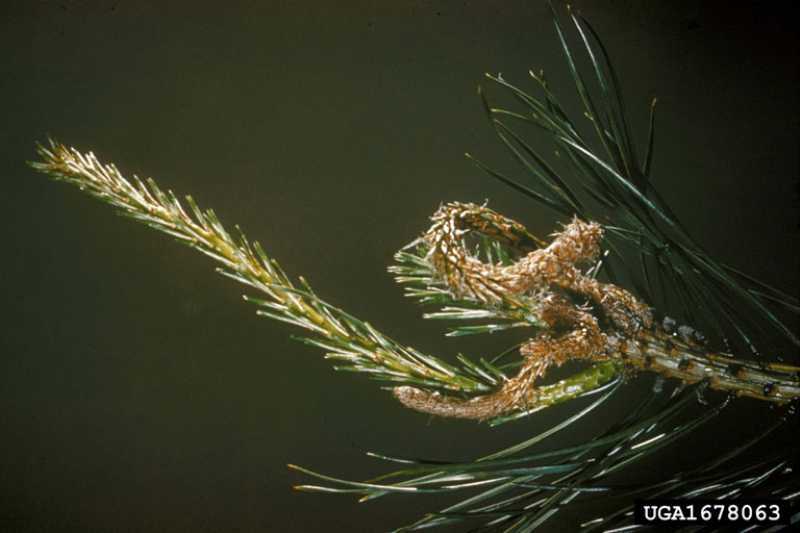 If left uncontrolled peachtree borers may kill a tree; younger trees in particular are prone to girdling. 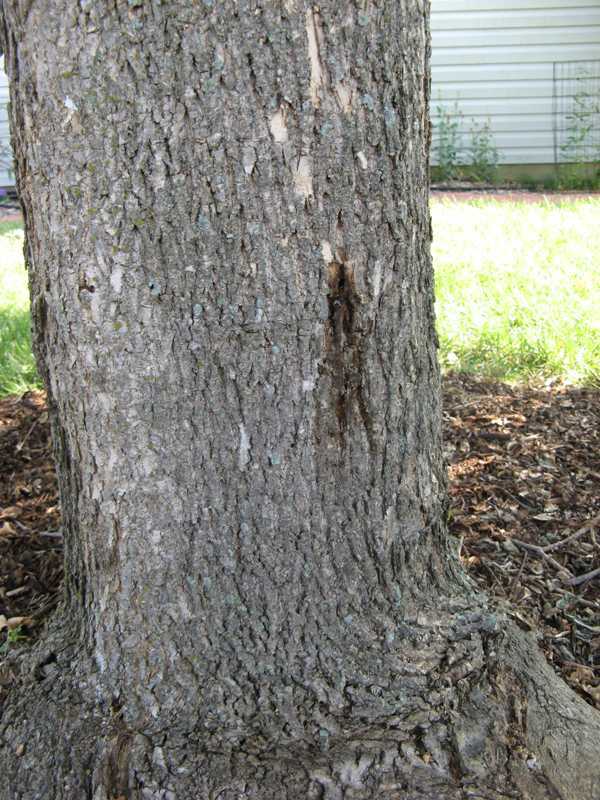 At the least these borers will diminish a tree's productivity and render it more susceptible to diseases and weather damage. The most obvious symptom of peachtree borer damage is the presence of gummy sawdust (frass) at the feeding sites. Vulnerable trees include apricots, cherries, peaches and plums. The most effective control strategies include inserting a stiff wire into each hole and killing the larvae. Bacillus thuringiensis (BT) can be shot into holes at 10 day intervals until no more frass appears. Try napthalene moth crystals to contain a serious infestation. Pheromone traps may be an effective control if you have only a few trees, but they won't attract the egg-laying females. Trap these by wrapping heavy paper around the trunk, from 2 inches below ground to at least 6 inches above, and then coat the wrap with a sticky material such as Tangle Trap. Destroy the wrap weekly, replacing it until no more larvae are trapped. Prevent peachtree borer problems by removing litter from around the tree in the fall. 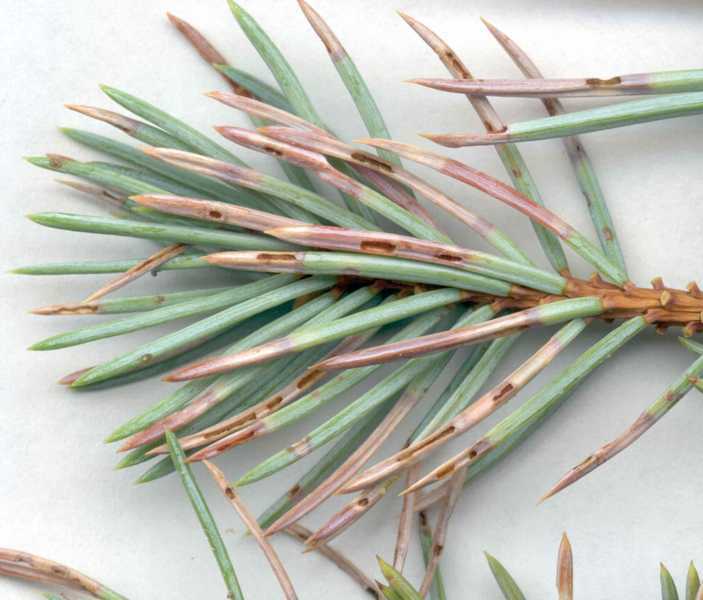 Avoid damaging the bark in cultivation. Keep trees well fertilized and properly pruned. Don't scrape off the gummy exudate produced by the borers, since it helps to seal the opening. You can also try washing the pests' mouths out with soap: hang bags of yellow or other soft soaps in the crotch of the tree. When it rains, it will wash the soap down the trunk, supposedly making it taste bad to borers. Finally, attract beneficial sapsuckers and woodpeckers to your property with suet during cooler weather (although they may not like soap, either! ).